It was worth a shot today. Not pitting Bottas was probably their only chance to win. Considering Bottas position in the championship it was worth the risk. I just don't see old mediums vs fresh softs being worth the risk. It was immediately clear that it wasn't the right call. The 2nd SC was the only thing that bought them more time. I can't help but feel 2nd & 3rd was the worst they should have walked away with today. I think it turned out to be the right call for Lewis. Bottas' tyres did not fair as well though. He said that he hadn't done long runs on the mediums, so the decision arose out of predictions rather than evidence. I think it was worth a shot at retaining the lead. I was thinking that at the time as well. But for Lewis it did actually pan out, and it was likely his practice runs they used to predict Bottas' performance. So it was a possibility. I agree that frustration came out in the end, once it did not turn out as hoped, but I am not sure I would call the strategy 'botched'. I see it more as a calculated risk that didn't pan out. Last edited by bourbon19 on Sun Jul 08, 2018 5:11 pm, edited 1 time in total. That was poor form from Lewis to skip the interview. What about his fans? I couldn't care less about an interview. They had to wait at least another 5 minutes for him to be interviewed. The real crime is all those fans who never saw parc ferme interviews 1950-2017, robbed. F1 has tried to interview the drivers in the heat of the moment for some kind of explosive reaction but most drivers simply avoid saying too much, as they've been trained to do. Vettel and Raikonnen are always calm and Hamilton simply avoided the interview altogether. In conclusion; the parc ferme interview is pointless. I just ask what is wrong with the Ferraris' steering system ? Both last week and this week a Ferrari driver seemingly couldn't turn around a corner properly. I think the FIA engineers should inspect the system to ensure it is fit for purpose. 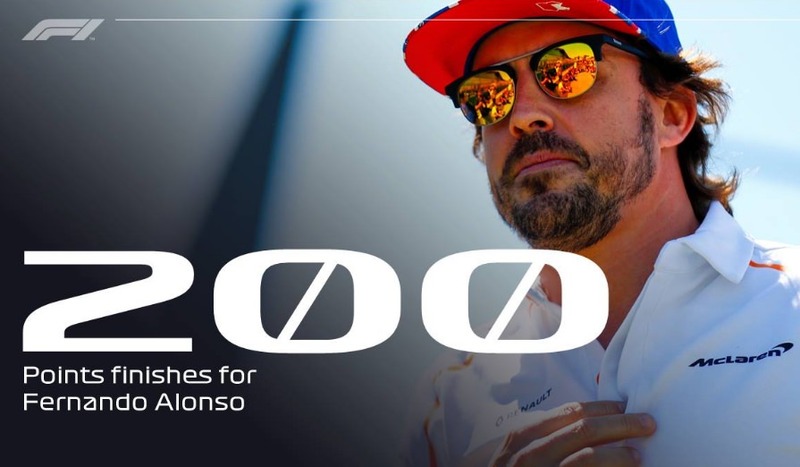 200th point finish for Alonso. Only 2nd driver to do so behind Schumacher (221)! Yes, bit of a strange comment. Like saying: Both last week and this week, a mercedes driver couldn't start the race properly and both lost several places. Should the the FIA engineers inspect the starting system to ensure the Mercedes cars can get off the line properly? Especially when you consider that Vettel had already overtaken Hamilton when the collision occurred. What do you mean he didn't earn it? He took the lead from Hamilton from the start with Bottas behind, controlled the race all the way till the SC and the consequent Ferrari strategy put him in between Bottas and Ham, with the two new restarts, then he kept attacking Bottas for P1 for some 8 or so laps while still having Ham threatening him from the back, then he took Bottas and won the race. And you say he didn't earn it. To be honest I thought Bottas had accidentally done precisely that at the end of Wellington a couple of laps before the actual pass. Seb had went to go around the outside but backed out at the last second and Bottas overshot the apex by quite a bit and went very wide. If Seb hadn't saw it coming and kept to the outside then Bottas was a passenger going into his sidepod. Not that I think it was deliberate of course but just pointing out the fine margins these guys are racing under. You completely ignore the fact that Ferrari has now taken out a Merc two races in a row. Like Toto said, "either they are incompetent or it was deliberate", either way not acceptable. Lewis had the pace and made up lost time, finishing only a few seconds behind Seb Vettel in the end. So, if he didn't get spun by an incompetent (give them the benefit of the doubt) Ferrari, Lewis very well could have finished in first. If Bottas had have made contact with Seb during their battles and spun Vettel, and Lewis ended up winning the race, you would be yelling and screaming and saying Lewis didn't deserve the win. The double standard here is comical. Hamilton made up most of that time because the safety car bunched them up. He was a pit stop behind about 10 laps before and while I doubt he would have finished a pit stop behind at the end (Vettel conserving up front and Hamilton giving it everything) he would have been well behind without it IMO. Vettel got a better start that Hamilton and then overtook Bottas when he needed to. To say it wasn't earned is laughable. Last edited by Black_Flag_11 on Sun Jul 08, 2018 7:10 pm, edited 1 time in total. If by double standard you mean not willing to subscribe to inane conspiracy theories, then count me in. Hamilton finished a few seconds behind Vettel because the SC bunched them up. It's a simple as that. Yes, he was quick, but so were the other front runners. Bottas looked quicker than Vettel for the most part and if Hamilton hadn't been punted off he wouldn't have found it easy getting past him. No reason at all to believe Hamilton would have won today. It was one of the better races of the year. The weather was perfect, the crowds were superb, it was a grand diorama of drama. Yes, Raikkonen screwed up. But the bad sportsmanship coming from the Mercedes camp leaves a foul taste in my mouth. There is a very good reason why I do not respect certain people as men, and this is one good example. For a few glorious laps we witnessed some excellent and intense nose-to-tail battling between the top cars. It is a shame we do not see such a level of competitiveness for the entire race, but hey, that is my Holy Grail. It is a shame Hamilton took off immediately after he parked his car. What is infinitely more shameful is how Brundle chased him down on the podium just so he could say a few words to his fans. As far as I am concerned, if Hamilton abandons his sole opportunity to speak to his fans, then it's on him. I hope that Liberty make changes so that if any driver abandons his opportunity to speak to his fans from parc fermé then that said driver is immediately evicted from the race track. Don't they fine drivers who don't attend pres conferences? Surely the parc-ferme interview is an 'official' engagement, no? I think you're being really harsh on Hamilton here. Not for the silly "interesting tactics from their side" comment, which deserves derision, but I think the condemnation for him not feeling up to speaking to everybody immediately afterwards is a bit over the top. He's just been involved in a really frantic last few laps, is probably feeling hard done by, and judging by the way his throat caught yesterday Silverstone is an emotional race for him. So he spoke to everyone a little later, is that really such a crime? Honestly, we complain how everyone is such a PR machine these days and then cry foul when one of the drivers shows himself to be human. They can't win. And when it boils down to it, I'll wager not a single fan bought a ticket to Silverstone in the hopes of hearing Hamilton speak. It's all about his performance on track and the PR bit at the end is just an add-on. It means nothing at the end of the day, just to hear a driver say "the fans at (insert track name here) are the best in the world and I always love coming here." Is that really worth all the outrage? I quite enjoyed Lewis' flounce off and his relationship with the door in the driver's 'get your cap' room. Brundle gave him his interview because people still wanted to see it. It had been a come-back (even if it didn't look that difficult). I think Bottas may well have earned a continuation of his contract, even though IMO today was a further illustration of why Merc may need a better driver next year. Excuse me but am I going crazy or has anyone forgot the Austria was the last race, not France? I mean, many people refer to "Ferrari taking out a Merc two weeks in a row" and "Vettel hit Bottas last week", but as I remember France was the race where Vettel took Bottas out and that was two weeks ago? This really has nothing to do with anything, I'm just confused. I must admit I'd totally forgotten! It was a double DNF for Mercedes so they might have forgotten. Did anyone catch what Kimi said right after the race ? Something about him trying his best but it not being good enough? He didn't look too happy obviously but seems like there's more to it than just the penalty. I think he drove brilliantly today except for the unfortunate incident. Which is a shame. He made some superb overtakes today. Vintage Kimi. What makes you think this way based on this race? well his comment after the race as ohwell said. just listened again and he says he did his best but there are opposite looks on what he is doing. did get the impression he was talking about ferrari. then there were the leclerc reports which although the media make things up there may be enough smoke to think a fire has started. also his comments in the race seemed particularly down even by his standards and he seemed to be questioning his strategy which he very very rarely does even when they have clearly screwed him. maybe its bollox but tbh as a fan i think its time to stop. hopefully give us one more win and a decent last season and then let leclerc whip vettels behind please. The last two sentences are true even though many will fail to admit. Not really. Few, if any, would be claiming the win was undeserved... Just as few, like you and longnose, are saying it now. Most recognize that Seb's win was deserved, though a few believe Lewis would have won under better circumstances. So, if Bottas had crashed out Vettel, you would have come out here praising a deserved Hamilton win? Or if he wasn't his own worst enemy at time (see spygate), which got him out of McLaren back to a by then uncompetitive Renault, then risking it all for McLaren Honda after ditching Ferrari, who have turned out to be Mercedes' real competition. Umm yea, if two drivers are taken out and the one sitting in third wins the race, it's hardly a great achievement. What you fail to realize though is that Hamilton was already behind both Vettel and Bottas when the incident with Kimi occured. To be honest, in hindsight, I'd say Vettel would have won this race even without Hamilton having a terrible start that dropped him to third place. Vettel seemed to have the pace today. Possible. But not certain. It could have been an epic duel. But Räikkönen thought otherwise. Could have been so but wouldnt matter. Vettel could have sailed away at that point and it still wouldn't mean that he didn't earn the win. Just as Hamilton earned the win in France. Of course it's even more ridiculous to suggest that given that he didn't and had to overtake for the win anyway. Bottas has had some iffy luck this season for sure. But this was a somewhat reminiscant of one of his performances from last year. Well down in qualifying ,Unable to put any pressure on Vettel then made to look a bit stupid when circumstances got him into the lead. His lap times were not as strong as Hamilton's who was in a slightly compromised Merc. It was a shame for Charles to have to retire. Another strong performance. He is a little bit of fine tuning away from being a genuine world title contender next year in the Ferrari. I am not outraged, just very disappointed that this man-child flounced off in a huff. At that very same parc fermé Raikkonen stood there, and took it on the chin, owning his mistake and penalty. Raikkonen was facing certain criticism, all Hamilton was facing was his own personal disappointment. The entire concept for changing the driver interviews from the podium to the parc fermé was to catch the drivers as they came out of their cars, unprepared and full of emotion. It gets more real, it strips away the PR machine and displays the drivers for who they really are. In other racing series I watch, the driver has a microphone stuck in his face while he is in the cockpit, or interviewed immediately after they exit the car. So what gives Formula One drivers a pass, where they must be coddled and protected from the big bad world? Obviously the idea of evicting drivers from the track for not doing parc ferme interviews is utterly ludicrous. But there is a grown up discussion to be had about parc ferme interviews. I don't like them. They are tacky and tabloidy. They purely exist to they and generate a bit of controversy by catching drivers when emotional. We already get to hear their unguarded comments on the radio anyway. They add nothing. I think the opposite, the numbers show the opposite. If you look at the key phase of the race, around the first pit stop. Everybody was pushing. Vettel, so Bottas could not undercut him. Bottas to undercut Vettel and Hamilton pushing to just catch them all. In Vettels 4 in laps, Hamilton was 1.1,0.5,1.4 and 1.6's quicker than him, outrageuous pace difference especially given that Hamilton had been pushing through traffic for half the stint whilst Vettel had clean air out front. Hamilton was similar amounts quicker than Bottas too. As soon as Hamilton got clean air he was taking on average 0.5 per lap out of Vettel and Bottas who by the end of the stint were both pushing at least. The Mercedes, in Hamiltons hands was very impressive today, no way Vettel beats Hamilton if Hamilton leads with Vettel 2nd. The Mercedes was at worst just as quick (probably actually much quicker) and with much better tyre life. Last edited by Johnson on Sun Jul 08, 2018 9:46 pm, edited 1 time in total. Why? What did Bottas do wrong? He had a storming start to go from 4th to 2nd, while his team mate lost the pole advantage and dropped a couple of places. Then after he kept very close to Vettel and didn't allow him breathing room. What was he supposed to have done that he didn't do? Hamilton is [ so rude], Always has been and always will be. He chocked the start and let both Seb and Val by. Kimi tried to follow suit and ran out of room. They touched and Lewis spun. That's racing. There's two teams fighting for the top. It's only natural while fighting for position there will be mix-ups and casualties. Lady luck was dancing with Mercedes early in the season. She's now traded partners with Ferrari. The season is still young, luck is fickle and she may trade partners again. If karma has anything to do with it, Lewis is due for a couple more DNFs. Last edited by Mod Titanium on Mon Jul 09, 2018 1:00 am, edited 1 time in total. There are times when the best thing you can say is nothing. I am glad that Lewis decided to cool down before he granted an interview. One of the great all time reactions I have seen is when someone put a mic in Dale Earnhardt's face after he had just been taken out and asked: "What happened out there?" Earnhardt replied: "You have the video, look at it!" and stormed off. My estimation of Dale went up a lot that day. I have seen too many drivers who mouthed off after a bad experience and not had the wisdom to say: "I am not going to say anything till I have calmed down!" I think all it is is that it was so recent and 2 similar looking incidents have popped up. And happen to involve the same 2 teams but opposite drivers. I just seem to have forgotten about Austria. I certainly prefer F1 being every 2 weeks. I seem to remember what happens each race much better then. And it also means I have a weekend between where I can do other things as I must always watch F1 when it is on! I did wonder, but even when he was eventually interviewed he was still out of breath. Hamilton on why he did not do interview. "I lost nearly 3kg trying to get back to the to today for you and my team. I barely had the energy at the end to stand, let alone talk. If you can't understand and appreciate that then I fully understand. However it was nothing to do with anger, literally just exhausted both physically and emotionally. Thanks to everyone for the incredible support this weekend, we win and lose together. Onwards and Upwards". Silverstone is the physically most demanding track on the calendar now. Hamilton is a [ so rude]. Always has been and always will be. He chocked the start and let both Seb and Val by. Kimi tried to follow suit and ran out of room. They touched and Lewis spun. That's racing. There's two teams fighting for the top. It's only natural while fighting for position there will be mix-ups and casualties. Lady luck was dancing with Mercedes early in the season. She's now traded partners with Ferrari. The season is still young, luck is fickle and she may trade partners again. If karma has anything to do with it, Lewis is due for a couple more DNFs. Well, I personally think that Bottas is due some good luck rather than Hamilton due some DNFs. That is a bit harsh. Hamilton did have poor start but it was pretty clear Kimi was fully to blame for the incident. From then on, Hamilton was good. Though one think I seem to be in the minority in is that I think Bottas was as good or probably slightly better than Hamilton today. Without all the chaos, I don't think Hamilton will have found it easy getting by Bottas after his bad start at all. Bottas looked quick today and judging how well he defended Vettel, getting past the same car will likely be harder still. The lack of fight from other drivers and the safety car made Hamilton's result look much better than it was. A lot of the drivers just let him by as if they were being lapped. His race didn't look much of a challenge. So I myself think Bottas was better given the fight and defending he did at the end. But Hamilton just is nothing like as bad as you make him out to be. Last edited by Mod Titanium on Mon Jul 09, 2018 1:01 am, edited 1 time in total.